Yesterday while I was having a slight cabin fever attack (I'm home a lot since this time of the year slows pest control to a crawl at my latitude), I decided to take care of a gaping hole in my home defenses: I needed a safe. Going forth and hunting around the area for one got me out of the house in a constructive way. What I mostly found was either way beyond my needs (huge safes priced in the thousands), or metal cabinets so pathetically flimsy that an intruder could pry open the door of one and escape with its contents long before myself or another could arrive to respond with lethal force. But at one location, almost the last one I visited, I found a real, fire resistant safe with a dial combination lock that was marked down hundreds of dollars from its MSRP because of a few scratches. I saved big because of something I can fix with a few pennies worth of paint (if I could be bothered to do so). Somewhere, there is a shipping insurance company that is hating life. With my new safe loaded up, I started on my way home, which included a stop at one of my banks to empty my safe deposit box of the silver I've had stored in it for a few years. This was a big part of the reason I sought out a safe: events can transpire that lead to depositors not being able to access what's theirs, be that because of massive banker and .gov incompetence, natural or man-made disasters, or even outright theft of safety deposit box contents and other accounts by chronically indebted, criminal governments. While I was at it, I decided to take out some rolls of U.S. half dollar coins to see if I could locate any that contain silver. The branch had $90 worth available, so I took them all. This is something that I've done before with success, and similar to my relatively new hobby of collecting big gains simply by hanging onto pre-1983 U.S. pennies. I need to have some cash on-hand at home in case disaster strikes and my bank accounts are not accessible, so if I failed to find any silver coins, I could simply hang on to the rolls for that purpose. I haven't done this much since the first time I tried it and blogged about doing so back in 2012, today being only the third time that I can remember. Perhaps I should try it more often though, because just like my first attempt at it, this time there was another silver coin hiding among the fiat junk: this 1969 piece, which at the time of this writing has a melt value of $2.65. That's a 430% gain with zero risk simply for finding the coin. 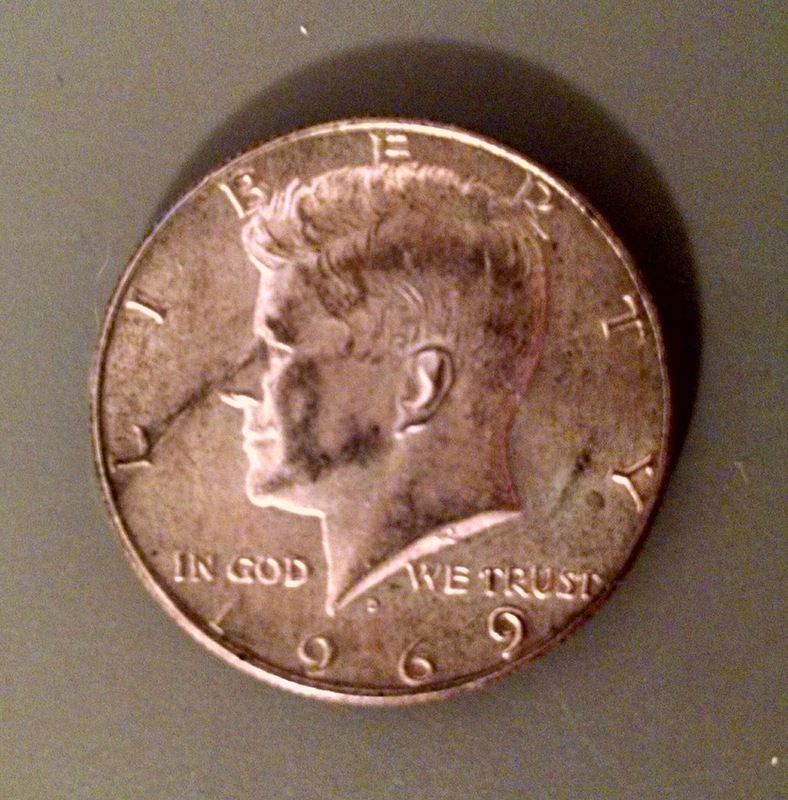 It has now joined my other silver holdings, including the 1967 half dollar coin I found a bit over two years ago. This is fun to do, and always worth it when you manage to find one of these coins, but it is only going to get harder and harder to do so: lots of other people have been sorting through these coins for years and taking them out of circulation just like I have. For building security with precious metals, this is not the way to do it, simply because you won't find enough of them to acquire a meaningful amount of silver. Instead, you should buy it from dealers like I also do and treat this kind of acquisition as supplemental only.